I loved the curve of the street curb and how the street imprint is also curved to fit. My guess is the builder back in the 1910s decided to curve the marker this way. 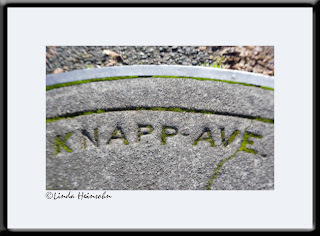 I'm fascinated with the imprinted street markers in Portland's sidewalks. It feels like a tiny thrill when, on my walks, I discover the old street imprint still existing from the early 1900s that no longer matches up with the current street name. Where we live in Southeast Portland was founded as its own city, a rival of Portland. After merging, several renamings occurred where there were duplicate names or oddities. One example is here in Westmoreland all the numbered streets are now 14th Street, 15th Street. However, the old street markers from before merging with City of Portland all read, 14th Ave, 15th Ave, etc.